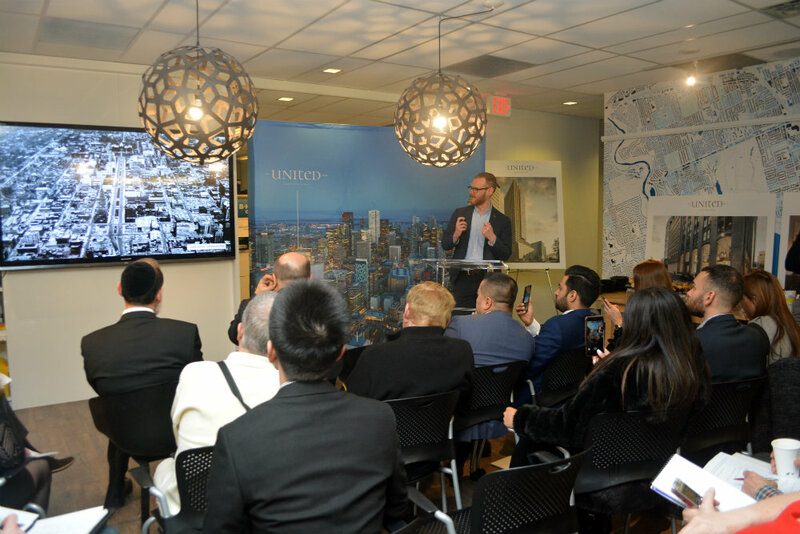 We were fortunate enough to receive an invite to the unveiling of the plans for The United Building by Davpart, which will be the tallest architectural heritage retention development in North America, and it’s happening right here in Toronto. Located on the northeast corner of University Ave. and Dundas St. West at 481 University, the building was the location of the Maclean Publishing Company/Maclean-Hunter from 1910 to the 1980s. The building is now designated as a heritage property, taking up a whole city block. Davpart has put together a dream team to bring The United Building to life, consisting of ERA Architects, Tomas Pearce Interior Design Consulting, Baker Real Estate, and B+H Architects. The unveiling actually took place onsite at the B+H offices, and Davpart is also located in the building. Clearly, the team is emotionally invested in this monumental development. 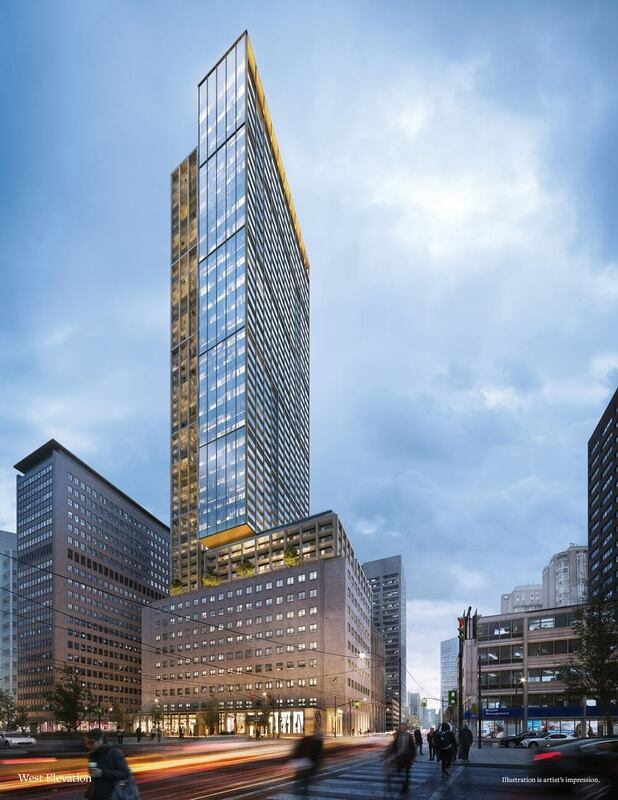 The United Building will feature commercial and retail space from the ground floor up to the 10th floor, from which residences will rise up 55 storeys. There is 224,245 square feet of commercial space, and 39,320 square feet of retail space. The architects went to great lengths to transform the public realm at street level. 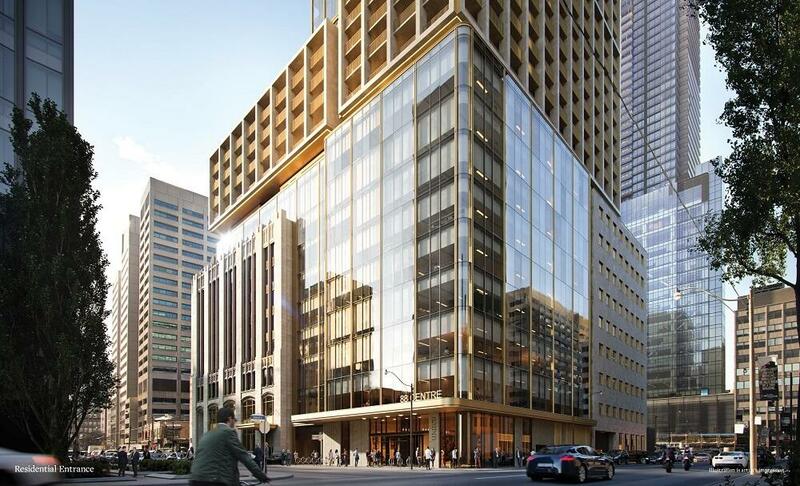 University Ave. is already an engaging experience for pedestrians, but the plans for The United Building are taking things to a higher level with the widening of sidewalks and use of historically inspired materials, like stone and brass. There will be a total of 759 condo suites, ranging from 300 to 1,400 square feet with studios, one-bedrooms, two-bedrooms, and three-bedroom floor plans. Some of the suites will have den, flex, and media room options, as well as a selection of two-storey plans. A few of the indoor amenities include a party room with kitchenette, a fitness centre, a sports lounge with billiards, a golf simulator, video gaming lounge, a library, a pool with a fireplace, a theatre, a sauna and rain room overlooking a courtyard, and much more! There’s also an “idea space,” which we imagine is an office-type, work station area, but we’re awaiting further details. There are plenty of outdoor amenities, including a four-season reflection pool, a bocce court, yoga deck, barbecue stations, alfresco dining, hot tubs, a zen garden, and a dog run with indoor pet spa. The condo entrance will be located at 88 Centre St. The team decided to make the entrance off of University Ave. because it is slightly quieter and has less foot traffic. This way, you arrive home off one of the busiest streets in Toronto, but you still have the peace and quiet you expect when arriving home. Residents will also have direct access to St. Patrick Station from inside the building, which is super convenient, and there are plans to connect The United Building to Toronto’s underground PATH system. We can’t wait to get the first look at The United Building floor plans! Stay tuned - we’ll be keeping an eye on this development as more details are made available. You can register here to stay in the loop!